It’s time for the latest app game that I decided to check out. Given that Sonic Forces was basically hype confirmed I was thrilled to hear about the mobile app. On the surface Sonic Forces is just another free runner so there’s nothing really special about it. Sonic already does have a free runner game when you think about it and that one has many more levels and characters. At the same time, I’ve never played any of those before so it all felt fresh to me. It’s definitely a fun game but one with diminishing returns unlike Pokémon Go which only gets more enjoyable as you level up. It’s a fun game but one that won’t last for very long. There is only one mode, free run. If you were hoping for 1V1 battles or mini games/a story then you’re out of luck. Every race brings 4 random racers together and you race for the goal. 1st Place will give you around 10 trophies and it typically takes 500 to level up. As you can see it takes a lot of races to level up towards the end and especially when you are fighting tougher opponents who won’t let you take 1st. You start out with 2 stages to play on and as you level up you unlock better stages and better rewards. The rewards are the points you get towards unlocking a specific character. It’s randomized and the characters are divided into rarity tiers so you’ll see how eventually you will have far more cards for characters like Sonic than Metal Sonic for example. Since this is the only mode in the game you will want to really enjoy it. The game suffered from bad connection errors for a little while but eventually it was able to fix itself. Now there are no issues with the gameplay which is certainly good since that is the entire game in a nutshell. There is definitely a lot of skill involved as you jump over obstacles and slide under others. You want to optimize your run and figure out the fastest way to clear a level. Given that you will be playing the stages very often, that shouldn’t be hard at all. There are three different levels in the game. The first is your user level. Upgrading this will help you with rings and your special attacks will be stronger. You get the exp for it by leveling upyour characters. Second is your online level, this is what gets you the better loot boxes and allows you to play more stages. You level this up by winning battles online. Finally there are the individual character levels. You beef these up by getting their cards from treasure chests. They amplify the character’s abilities by a small amount but it’s enough to rip the scales your way. As far as I can tell each character has 16 levels total. I can’t confirm that of course as I don’t have anyone who is over level 8 but it’s based on a little guide they have in the game on what you unlock with each level. I’m sure the exp requirement skyrockets by the end so only the most serious of players, or the ones who pay a bunch will reach that point. The graphics are really sharp. The character models are really well done and the backgrounds are a blast. It at least does feel like a lot of effort went into the graphics. I also enjoy the music but it’s just the one theme which can be a bit repetitive at times. It’s the inspirational version of the main Sonic Forces theme so it’s fitting for any fast paced race I’d say. They should definitely add more themes in as you level up though. Each stage should honestly have its own theme and I can’t even see how that would be tough to implement. Shouldn’t they just grab the songs they need from Sega and put it in? There’s definitely a lot of replay value to the point where it’s infinite but how fun is this replay value? After all, there’s no point if you’re not going to try and collect everything. As I alluded to in the intro, the game slowly loses the joy that it had from the start. I think the biggest detractor is how you will actually lose points once you level up if you get 3rd or 4th which is unfortunate since the competition does get a lot stronger do it will be tough to get in the top 2 after a while. The sheer repetition of playing the same level over and over again will get to you. If you think about it, most mobile games effectively have you doing the same things over and over again but they cleverly mask this or the gameplay is so fun that it doesn’t even matter. You can say that Pokémon Go is incredibly repetitive but at least it is also a blast at the same time. That’s not to say that this game isn’t fun though. I think it’s the kind of game that is best in small doses. Just play a few races every day and you’re set. I’ll give it some props for being lenient on how long you can play as well. Some games have an energy meter so you can only play a certain amount each day. Fire Emblem has that but it’s so lenient that it barely ever matters. Forces limits how many chests you can get in a day, but that’s all. You can keep playing to your heart’s content. 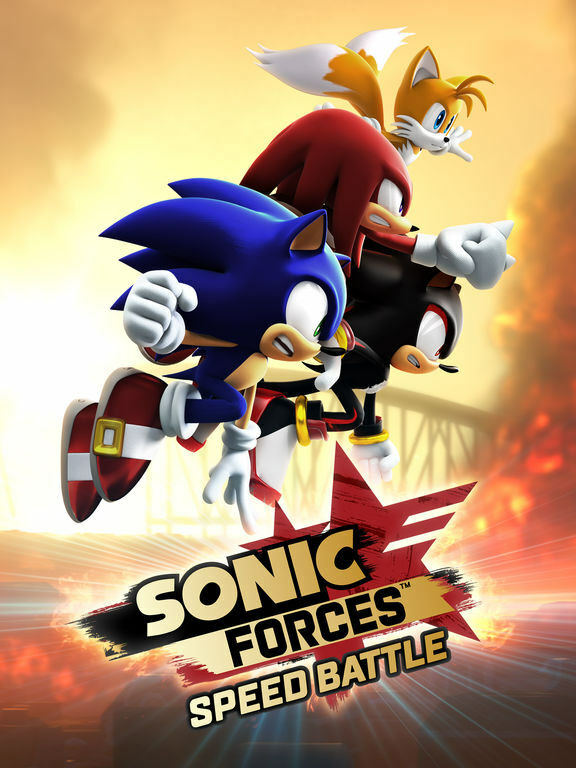 This entry was posted in 7 Star Games, App Games, Game Reviews, Games, Reviews and tagged Free Runner, Free to Play, Game Review, Mobile App, Review, Sega, Sonic, Sonic Forces, Sonic The Hedgehog, Speed Battle, Spinoff, Video Game Review by dreager1. Bookmark the permalink. Dreager1, is your user name in Speed Battle “Bass.exe?” If so, I fought a guy with that name and I thought of you. Will you do a review of Marvel Strike Force? It might be worth playing if you are willing to spend months upgrading one character. The grind in that game is real, and not in a good way. Pro tip: do not spend Power Cores on anything besides Campaign energy refills. You will thank me later. Get Yondu, Drax, Quake, Hawkeye, Night Nurse, Crossbones, Captain America, Black Widow, and Gamora as soon as possible. This list is a great pool of top tier fighters, with Black Widow, Crossbones, Yondu, Hawkeye, and Quake being the best team in my honest opinion. Sounds like a pretty good roster. I’m not familiar with night Nurse though so I’m surprised that she is so good. Definitely a character that I’ll have to keep an eye on. I’m definitely out of the loop because I didn’t even know Sonic Forces had raids. Sonic Forces Speed Battle does not feature raids, but Strike Force does. I should have made that a bit clearer. Anyway, look us up if you want a strong Alliance.